Book Shark does great reviews. Here is another, of Pearce’s new book concerning the Kalam Cosmological Argument (Did God Create the Universe from Nothing? Countering William Lane Craig’s Kalam Cosmological Argument). We love the list format they take, and appreciate the balanced nature of the reviews. 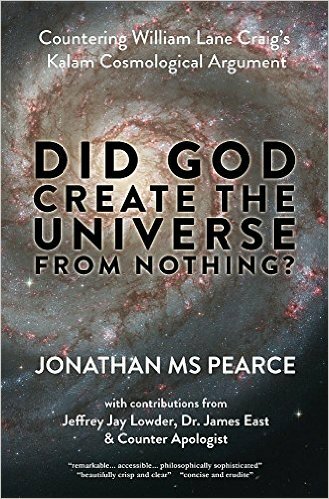 “Did God Create the Universe from Nothing?” is a very good intermediate-level book that critically addresses the Kalam Cosmological Argument (KCA) to satisfaction…. Jonathan M.S. Pearce provides the readers with a user’s guide on how to counter William Craig’s defense of the KCA. This useful 143-page book includes the following seven parts: 1. The Background, 2. The Argument, 3. Premise 1, 4. Premise 2, 5. The Syllogism’s Conclusion, 6. Potential Objections, and 7. Conclusion. 1. A well-written, well-researched book. 2. Pearce tackles William Lane Craig’s favorite argument for the existence of a “God”, the Kalam Cosmological Argument (KCA). 3. Great use of reason and a strong philosophical background to dismantle the KCA. 4. Provides the history behind the KCA. 5. If you are going to debunk the KCA, might as well dissect it from its most prominent defender’s point of view, William Lane Craig. 6. Goes over the three steps of the KCA in detail, the syllogism. 7. Goes over key concepts that will help the reader understand the premises. 12. Explains why the KCA and libertarian free will are incompatible. 19. Provides a chapter where Pearce sets out to what he thinks an apologist like Craig might claim as counter-arguments and proceeds to defend his arguments from such objections. 20. A satisfactory conclusion. “Indeed, the real aim of this book was not to disprove that God created the universe but to show that the KCA cannot prove that God did, using those premises and the resulting conclusion. 21. Notes and formal bibliography provided. 1. I fear that this book will have a limited audience because philosophy is not everybody’s cup of tea. Furthermore, this book’s focus is solely on the KCA. 2. Despite being a book that at worse is an intermediate level book, some concepts are still hard to follow. 3. Lack of visual supplementary material that may have helped the layperson better understand the concepts presented. In summary, this is a solid effort from Pearce. I like that he goes after William Lane Craig’s best arguments in defense of the KCA and has the integrity to state what we currently know and what we don’t know. In some respects, Craig makes use of the God of the Gaps fallacy to insert “God” where at best we must acknowledge our common agnosticism. Not the easiest topic to follow but those interested in it will find this book to be worth the read. I recommend it! Further suggestions: “The Problem with “God”: Classical Theism under the Spotlight” by the same author, “God’s Gravedigger: Why no Deity Exists” by Raymond Bradley, “Unapologetic: Why Philosophy of Religion Must End” and “Christianity In the Light of Science” by John Loftus, “The Portable Atheist” by Christopher Hitchens, “Godless: How an Evangelical Preacher Became One of America’s Leading Atheists” by Dan Barker, “A Manual for Creating Atheists” by Peter Boghossian, “Jesus Interrupted” by Bart D. Ehrman, “Why I Am Not a Christian” by Richard Carrier, “The Soul Fallacy” by Julien Musolino, “The Big Picture” by Sean Carroll, “The Illusion of God’s Presence” by John C. Wathey, “The Not-So-Intelligent Designer” by Abby Hafer, and “The Universe” by John Brockman. It would certainly be interesting to see what he thinks! I read this book a while back, before I took a blogging hiatus, and it was excellent. I really liked how you took the time to summarize and list the many problems with the Kalam. I think that that list allows us to see the meta-problem with the Kalam argument, namely that there are so many plausible objections to it that their cumulative weight is much heavier than the argument’s conclusion is. In other words, the chances of all those objections to the Kalam being wrong are very small, therefore the argument is probably wrong.